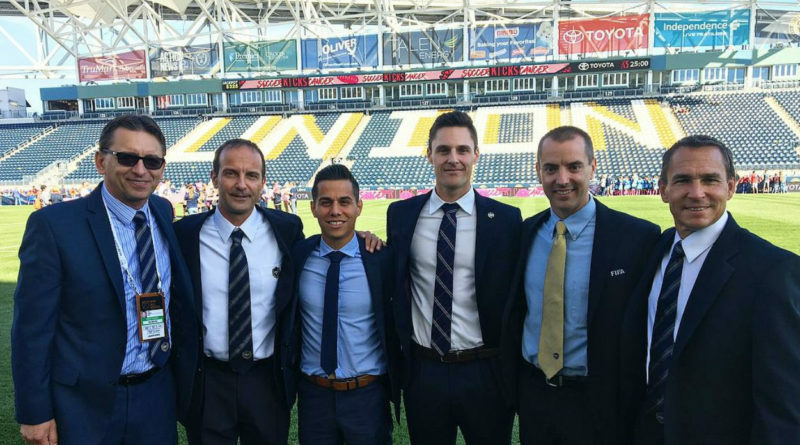 Those are the words of Joseph Dickerson, one of the up and coming referees in United States Soccer, when he received confirmation through last season that he would be taking charge of a Major League Soccer game for the first time. Although he wasn’t expecting to lead out Philadelphia Union and Orlando City in the final week of the 2017 MLS campaign, he demonstrated over the 90 minutes that he was more than ready. This Decision Day match-up may have had no postseason implications, but there was still a crowd of more than 18,500 at Talen Energy Stadium to witness the Union’s season finale, and to say their farewell to the legendary Brian Carroll, who had spent the past seven years with the franchise and retired as the fourth highest appearance maker in MLS history. The hosts bowed out of 2017 in style by romping to a 6-1 win and, although blowing his whistle for kickoff was almost as common as whistling for a foul, Dickerson passed his first test. “What a game for a debut! Seven exquisite goals, and the atmosphere was electric,” recalled Dickerson, talking to proreferees.com. “I was able to settle in and get comfortable really quickly, and the players responded well to the moments that required management. “With the way the game went, I had to focus on not over-complicating things and was able to soak in the experience. I’ve never been one to get nervous before a match, but there was certainly a bit of extra excitement and anticipation of the moment. It was an early age when the California-born official began his refereeing journey. At the age of 10, while a keen soccer player, Dickerson took the whistle to help learn more about the game, and to earn a bit of extra money. Now 30, he is full of gratitude to those who mentored him from youth soccer onwards, leading up to last season’s MLS debut. That includes those at PRO who have aided his development, making sure that his transition into the highest level of US Soccer was seamless. Refereeing took a backseat during Dickerson’s college years. He competed as a collegiate rower, and was then a semi-professional cyclist while at UC Davis. But, upon graduation, he decided that a career in officiating was the way forward, and he hasn’t looked back since. “My experiences had more than adequately prepared me for this match,” Dickerson continued. “The development group coaches do a great job of exposing us to true professional atmospheres so that when we make the step up to the first division, there are fewer surprises. “Prior to this match, I had refereed games in nine different venues, three of which are MLS stadiums. I had been to the East Coast three times, and I had refereed in front of large, exuberant crowds, such as 11,000 fans in Sacramento and 25,000 fans at Cincinnati FC. So I was already very comfortable with the travel, as well as the environment of a professional stadium and crowd. “I was very happy with Joe’s first MLS performance. Joe earned his appointment through hard work and dedication; he was the most consistent performer in our development group and, even though he started at our premier tier, his excellent performances in the first half of the season earned him a jump two tiers up to the elite tier at midseason.